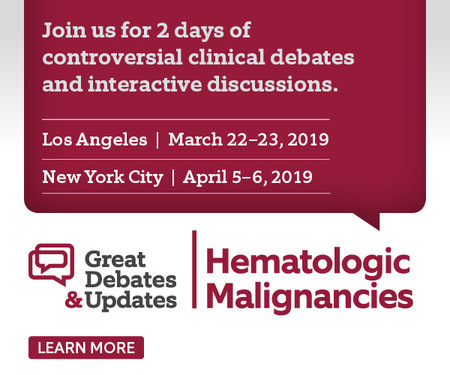 In this 2-day, debate-style series, nationally known thought leaders take opposing sides on clinical-and sometimes controversial-topics currently disrupting the practice of hematology and oncology. Join us for a unique educational experience. In this 2-day, debate-style series, nationally recognized thought leaders take opposing sides on clinical-and sometimes controversial-topics currently disrupting the practice of hematology and oncology. Through comprehensive review of the latest clinical advancements in hematologic malignancies, robust audience engagement, and ample discussion, participants will leave equipped with practical implications and applications to put into practice immediately. This live educational activity is designed to meet the educational needs of those who are involved and/or interested in the treatment of patients with multiple myeloma, lymphoma, chronic lymphocytic leukemia, and acute myeloid leukemia. Visit greatdebatesinhema.com for details and use code "EVENT50" for a discount on registration!